Norwich City Football Club (also known as The Canaries or City) is an English professional football club based in Norwich, Norfolk. Norwich returned to the Premier League in 2015, having first been promoted to the top flight in 1972. Norwich have won the League Cup twice, in 1962 and 1985. The club has never won the top flight, but finished third in 1993. The fans' song "On the Ball, City" is regarded as being the oldest football song in the world which is still in use. The club plays in characteristic yellow and green kits and are affectionally known as The Canaries as a reference to their colours and club badge. Norwich City F.C. was formed following a meeting at the Criterion Cafe in Norwich on 17 June 1902 and played their first competitive match against Harwich & Parkeston, at Newmarket Road on 6 September 1902. Following a FA Commission, the club was ousted from the amateur game in 1905, deemed a professional organisation. Later that year Norwich were elected to play in the Southern League and with increasing crowds, they were forced to leave Newmarket Road in 1908, moving to The Nest, a disused chalk pit. The club's original nickname was the Citizens, although this was superseded by 1907 by the more familiar Canaries after the club's chairman (who was a keen breeder of canaries) dubbed his boys 'The Canaries' and changing their strip to yellow and green. During the First World War, with football suspended and facing spiralling debts, City went into voluntary liquidation on 10 December 1917. Norwich were also denied their first foray into Europe with the ban on English clubs after the Heysel Stadium disaster. City bounced back to the top flight by winning the Second Division championship in the 1985–86 season. This was the start of what remains in 2012 a club-record nine consecutive seasons in the top division of English football. High league placings in the First Division in 1986–87 and 1988–89 would have been enough for UEFA Cup qualification, but the ban on English clubs remained. They also had good cup runs during his period, reaching the FA Cup semi-finals in 1989 and again in 1992. During 1992–93, the inaugural season of the Premier League, Norwich City quickly emerged as surprise title contenders, before faltering in the final weeks to finish third behind the champions, Manchester United, and runners-up Aston Villa. Their top scorer that season was Mark Robins, who had been signed from Manchester United the previous summer. The following season Norwich played in the UEFA Cup for the first time, losing in the third round to Inter Milan, but defeating Bayern Munich. Winning 2–1, Norwich were the first British team to beat Bayern Munich in the Olympic Stadium. Mike Walker quit as Norwich City manager in January 1994, to take charge of Everton and was replaced by 36-year-old first team coach John Deehan who led the club to 12th place in the 1993–94 season in the Premier League. Norwich began the 1994–95 season well, despite the pre-season loss of top scorer Chris Sutton to Blackburn Rovers for a national record £5million, and by Christmas they were seventh in the league and a UEFA Cup place was a realistic possibility. However, Norwich then went into freefall, won only one of their final 20 league games and slumped to 20th place and relegation, ending a nine-season run in the top flight. Shortly before relegation, Deehan resigned as manager and his assistant Gary Megson took over until the end of the season. Martin O'Neill, who had taken Wycombe Wanderers from the Conference to the Second Division with successive promotions, was appointed as Norwich City manager in the summer of 1995. He lasted just six months in the job before resigning after a dispute with chairman Robert Chase over money to strengthen the squad. Soon after, Chase stepped down after protests from supporters, who complained that he kept selling the club's best players and was to blame for their relegation. Chase's majority stakeholding was bought by Geoffrey Watling. English television cook Delia Smith and husband Michael Wynn-Jones took over the majority of Norwich City's shares from Watling in 1996, and Mike Walker was re-appointed as the club's manager. He was unable to repeat the success achieved during his first spell and was sacked two seasons later with Norwich mid-table in Division One. Nigel Worthington took over as Norwich City manager in December 2000 following an unsuccessful two years for the club under Bruce Rioch and then Bryan Hamilton. He had been on the coaching staff under Hamilton who resigned with the club 20th in the First Division and in real danger of relegation to the third tier of English football for the first time since the 1960s. Worthington avoided the threat of relegation and, the following season, led City to a playoff final at the Millennium Stadium, which Norwich lost against Birmingham City on penalties. The club finished in 12th place in their first season back in the Premier League. Manager Paul Lambert resigned within a month of the season's close to take up the vacant managerial spot at league rivals Aston Villa, and was replaced by Chris Hughton. The 2012–13 season started poorly with a 5–0 defeat to Fulham and a bad run of form that was followed by a club record unbeaten run in the Premier League. A 1–0 home defeat to Luton Town on 26 January 2013 resulted in Norwich becoming the first English top-flight team to lose a FA Cup tie to a non-league side in 24 years. Norwich secured their third year in the Premier League with consecutive victories in the last two games of the season, to finish 11th in the league. However they were relegated back to the Championship after finishing 18th in the 2013–14 season. After a mediocre first half of the 2014–15 season, Neil Adams resigned which paved the way for the appointment of then Hamilton Academical manager Alex Neil in January 2015. The appointment reinvigorated Norwich's season and after narrowly missing out on automatic promotion back to the Premier League, victory in the 2015 Championship playoff final secured an immediate return to the top division of English football. A simple canary badge was first adopted in 1922. The current club badge consists of a canary resting on a football with a stylised version of the City of Norwich arms in the top left corner. For the club's centenary celebrations in 2002, a special crest was designed. It featured two canaries looking left and right, and a ribbon noting the centenary. Norwich City F.C. played at Newmarket Road from 1902 to 1908, with a record attendance of 10,366 against Sheffield Wednesday in a second round FA Cup match in 1908. Following a dispute over the conditions of renting the Newmarket Road ground, in 1908, the club moved to a new home, in a converted disused chalk pit in Rosary Road which became known as "The Nest". By the 1930s, the ground capacity was proving insufficient for the growing crowds and in 1935 the club moved to its current home in Carrow Road. The original stadium, "the largest construction job in the city since the building of Norwich Castle... was "miraculously" built in just 82 days... it was referred to [by club officials] as 'The eighth wonder of the world'" An aerial photograph from August 1935 shows three sides of open terracing and a covered stand, with a Colman's Mustard advertisement painted on its roof, visible only from the air. 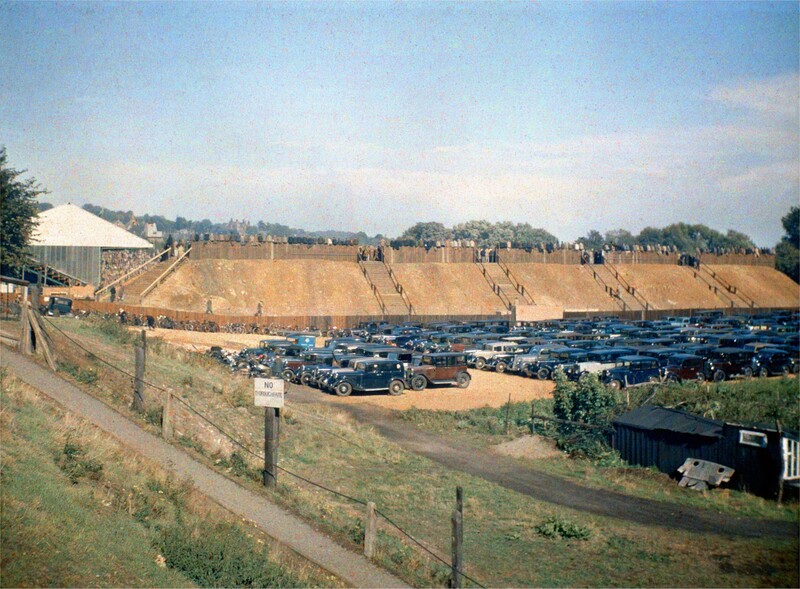 Another photograph, taken on a match day that same season, shows that despite the era's limited car ownership, a parking area was provided at the ground. 1963 saw the record attendance for Carrow Road, with a crowd of 43,984 for a 6th round FA Cup match against Leicester City, but in the wake of the Ibrox disaster in 1971, safety licences were required by clubs which resulted in the capacity being drastically reduced to around 20,000. A two-tier terrace was built at the River End and soon after seats began to replace the terraces. By 1979 the stadium had a capacity of 28,392 with seats for 12,675. A fire in 1984 partially destroyed one of the stands which eventually led to its complete demolition and replacement by 1987 of a new City Stand, which chairman Robert Chase described as "Coming to a football match within the City Stand is very much like going to the theatre – the only difference being that our stage is covered with grass". After the Hillsborough disaster in 1989 and the subsequent outcome of the Taylor Report in 1990, the stadium was converted to all-seater with the corners being filled. Today, Carrow Road is an all-seater stadium, with a capacity of just over 27,000. While much of the support that the club enjoys is local, there are a number of exile fan clubs, notably in London and stretching from Scandinavia to countries further afield such as the United Arab Emirates and Hong Kong. The club also maintains a healthy celebrity support with celebrity cook Delia Smith and comedian Stephen Fry both having moved from fans of the club to running it. Actor Hugh Jackman is also a fan of the club, having been taken to Carrow Road as a child by his English mother, though he turned down an opportunity to become an investor in the club in 2010. BT Sport Presenter Jake Humphrey, who was born in Peterborough but moved to Norwich with his family at the age of nine, is another celebrity supporter. Also Sky Sports presenter Simon Thomas, who is Vice-President of the Norwich City Supporters Trust, Norfolk-born musician, model and media personality Myleene Klass, singer Sophie Ellis Bextor, and Labour ex-politician Ed Balls. Journalist and broadcaster Sir David Frost OBE also declared his love for The Canaries during his lifetime. The highest transfer fee received for a Norwich player is £8 million, from Queens Park Rangers for Leroy Fer in August 2014, while the most spent by the club on a player was the signing of Ricky van Wolfswinkel for £8.5 million (€10 million) from Sporting Lisbon. The club's highest league finish was third in the FA Premier League in 1992–93. The 2013–14 season was Norwich's 24th in the top flight of English football. The club has won the League Cup twice (most recently in 1985) and reached the FA Cup semi-final three times, most recently in 1992. Norwich have taken part in European competition just once, reaching the third round of the UEFA Cup in 1993–94 and are the only British side to beat Bayern Munich in the Olympic Stadium. Between 2006 and 2008 the club was sponsored by airline Flybe but on 26 April 2008, it was announced that the company was stepping down as the main sponsor. On 29 April 2008 it was announced that Aviva which has offices in the city and is the parent company of the former Norwich Union, would be the new shirt sponsor, having signed a three-year contract. In 2009 the deal was extended until the end of the 2011–12 season. It was further extended in 2012 by four more years to the end of the 2015–16 season. During the club's centenary season, a "Hall of Fame" was created, honouring 100 former players chosen by fan vote. Further players have been inducted into the Norwich City Hall of Fame in 2003, 2006 and 2012. For a more detailed list of these winners of the Barry Butler trophy, see Norwich City Players of the Year. As of 6 January 2016. Not including caretaker managers. Only professional, competitive matches are counted. Each time they meet, Norwich and Sunderland contest the Friendship Trophy, an honour dating back to the camaraderie forged between fans of the two clubs at the time of the 1985 League Cup final that they contested. Norwich are the current holders having beaten Sunderland 3–1 at The Stadium of Light on 15 August 2015 in the 2015-16 Premier League. In the 2001 film Mike Bassett: England Manager, the eponymous hero, played by Ricky Tomlinson, rises to prominence as a result of success as manager of Norwich City, having won the 'Mr Clutch Cup'. The celebratory scenes of the open-top bus ride around the city (right) were actually shot in St Albans, Hertfordshire, rather than Norwich. In 1972 the Children's Film Foundation released a movie called The Boy Who Turned Yellow, about a boy living in London who supports Norwich City. In the film, he and everyone and everything else on his tube train are turned yellow. That night he is visited by a yellow alien called Nick, short for electronic, who teaches him all about electricity. The link to the football club is used to explain why the boy already has so many yellow things in his bedroom. For more details on this topic, see Norwich City L.F.C..
Norwich City Ladies is the women's football club affiliated to Norwich City. They are managed by Scott Emmerson and compete in the Women's South East Combination League, in the third tier of English women's football. According to Norwich City, "They are the official women's team of Norwich City Football Club and are linked to the Girls' Centre of Excellence programme". Consequently, 95% of the club's players have progressed from the youth ranks. Norwich City LFC play their home games at Plantation Park, Blofield, Norwich. i^ : This includes matches played at an amateur level. ↑ 92.0 92.1 Club holds Annual General Meeting, Norwich City FC, 19 January 2011. Retrieved 14 January 2012. This page was last modified on 13 January 2016, at 15:13.